Travel smart, secure and in style. This classic, professional and timeless luggage innovation from Joy features a mobile dresser that makes packing and unpacking much easier. Revolutionary SpinBall wheels provide smooth 360-degree movement that keeps up with you as you're dashing through the airport, while the handy matching tote makes the perfect travel companion. Both pieces provide RFID protection to safeguard your credit card and passport information. Reach your destination with the peace of mind this trusted brand brings. Max Capacity: Approx. 30 lbs. I absolutely had to have the drawers and spinball wheels!! I choose the leather bags, although they are heavier then the others it is definitely more durable and sturdy, it has handles on all sides, absolutely gorgeous gold trim and the drawers are a game changer!! It rolls everywhere, so easy!! 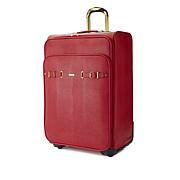 This luggage was beautiful and great quality. It looks just as it did on line . I recommend this product for purchase. I have had Joy' luggage for many years. I travel a lot so it takes a lot of beating. My first piece of luggage from 10 years ago finally gave out and I was happy to be able to purchase the new improved model with the spinball wheels just a few months ago and now the cabin size combo. I absolutelly love it. No more torn wheels, they are well protected. Orange is my favorite color and this is my first set and I love love love it. Worked perfectly. I just wish it came in like a 4 to 5 piece set. 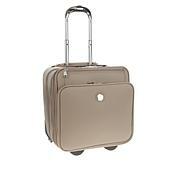 Absolutely love my luggage ensemble- I got the Gray set - very classy ! Weighs a little more but totally worth it , leather is beautiful !! !